The modest silhouette continues to gain momentum with influencers, international runways and global brands. The impact of social media is undeniable and the access this brings to millennial influencers has changed the way the world operates. The simple act of sharing images of their lives and modest ensembles, on their blogs and social media, has given the world access to an otherwise unknown within the world of fashion. 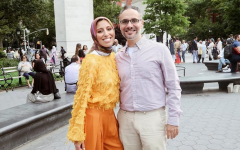 The question on the mind of many, from advocates for the modest movement, to those who critique it is: is modest fashion a fleeting trend or a permanent shift in the sartorial world?